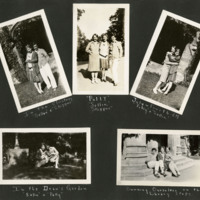 Scrapbook page features five images labeled (clockwise from left): In the cloisters, Sallie and Skipper; Polly, Sallie, Skipper; July 4th a.m. Polly and Sallie; Sunning ourselves on the Library Steps; In the Dean's Garden, Sallie and Polly. 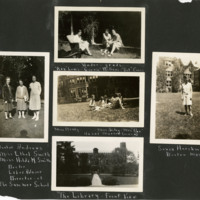 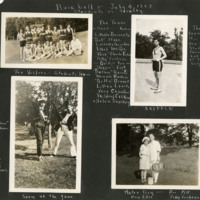 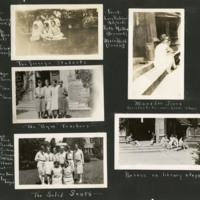 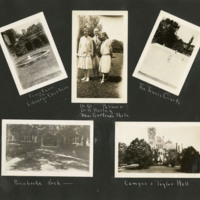 Scrapbook page featuring five photos labeled (clockwise from top left): Fountain on Library-Cloisters; Dr. GI Palmer, Dr. H. Harley, Miss Gertrude Nafe; The Tennis Courts; Campus and Taylor Hall; Pennbroke Arch. 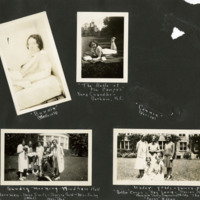 Scrapbook page features four images labeled (clockwise from top left): Miss Edna Winslow, Dorthey Sp; The Irish and Dutch: Polly, Skipper, Thressa; Miss Brady, Phys. 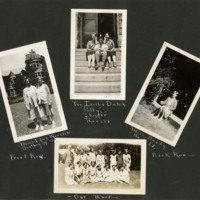 Ed; Our Unit.